24 Epic Battles - Now YOU are in command! 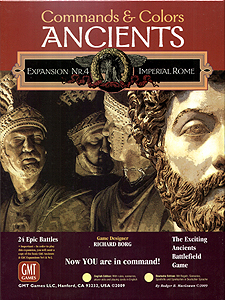 Command & Colors Ancients allows you to refight epic battles of the ancient world. In this expansion the Roman armies still battle barbarians, but now most of the battles are fought to preserve the Roman Empire rather than expand it. Rome's enemies are becoming more proficient while Rome's legions are declining in ability. Ominously, even while outside threats increase, Rome's legions are increasingly consumed in costly wars fought by rival generals aspiring to become Emperor. Units in both armies can only move and fight when ordered. The command playing cards supply those orders, providing an element of luck that creates a fog of war and presents players with both challenges and opportunities. You must maximize your opportunities by playing your command cards judiciously. How well you handle the diverse units, their weapons, and the terrain, will determine victory. IMPORTANT: In order to play this expansion, you will need a copy of the basic Commands & Colors Ancients Game, plus C&CA Expansions 1 & 2.